How many judges does it take to judge the Lizard canaries at the World Show? Traditionally, the answer is two; they divide the classes between them but collaborate on the medal awards. At Bari in 2014, Vito Ventre judged the entire section by himself, and did a very good job too. At Cesena no less than six judges were called upon; one for the golds, another for the blues, and four, yes four, for the silvers. What was going on? Compare those figures to the Lizards: 6 judges for 345 birds (average = 57). There was always a risk that enlarging the classification for Lizard canaries would have unintended consequences, but I hadn’t foreseen this one. Could it be that more classes mean more opportunities to ‘mix and match’ judges? Average figures only tell part of the story. A judge is normally expected to assess around 130 birds a day but will be allocated more than one variety, so the time he spends with a particular breed will vary according to the size of the classes and his other judging commitments (3). In the Lizard section, only one judge’s workload fell within the normal range, a total of 132 birds. The other judges dealt with 76, 59, 39, 27 and 12 birds. I am informed that all classes of all sections are allocated to the respective judges before the judging commences, but are we really to believe that this judging jamboree was intentional? COM has done some pretty daft things in the past, like drawing the judges’ names from a hat (4). Whoever is responsible for these decisions really ought to explain their logic (5). COM may claim that its judges are competent in all varieties of canary, but exhibitors don’t want versatility, they want want expertise. Surely judging skills and resources should be allocated so that they best match the needs of a particular breed? This is the World Show, not a blind date. Of the six judges at Cesena, I know of only two with expertise in judging Lizards (6). I have no reason to doubt the competence of the others, but some had only a brief involvement in the process; there was no continuity and the benefit of teamwork was lost. Furthermore, the judges were being pressed for time. According to my information, the judging programme was shortened from two days to a day and a half. To make matters worse, the decision was announced on the second day, leaving the judges little opportunity to reschedule their work. Apparently two of the judges were drafted in at the last minute to meet the new deadline. If so, it was a risky strategy. All canaries need time to settle if they are to display their show qualities, but the Lizard needs more than most for the simple reason that its spangles take time to line up. A good bird can easily be overlooked if it is rushed. Inevitably, there were examples of decisions being made in haste at Cesena. Tony Horton won a bronze medal with his broken cap silver hen in the largest class of the Lizard section. Tony is young and enthusiastic; he is not afraid to take on the best in the world. His medal was well-deserved, but it was for the wrong bird (7). He showed me an even better bird that he had entered in the same class. She had been awarded 93 points at the Gouden Ring show. Take a look at this photo; you can see why. At Cesena she was awarded only 89. At least Tony still won his medal, but there will be other exhibitors who will be wondering what went wrong. The photograph at the head of this article shows another broken cap silver hen, this time a bird from Jules Etienne. You can see a close-up of her below. She had previously won Best Lizard at Liege, the top show for Lizard canaries in Belgium. I expected her to be in contention for a medal, instead she was awarded 87 points. Sadly these things happen at the World Show, but it is exasperating to think that it may have happened for reasons beyond the control of the judge or the breeder. For all its faults, the World Show in Cesena was a great occasion and it was a privilege to see some wonderful birds. Here are a few photographs from Joe Coakley to prove it. I counted the birds in each section, but can’t vouch for total accuracy, and have therefore rounded the figures. COM uses the name ‘Scotch’ rather than ‘Scots’. In some of the more popular varieties such as Glosters and Fifes, a single class may contain more than 100 birds, thus a judge could spend an entire day assessing only one class and its associated class of stams. This happened at Porto and Almeria I believe, although to what extent I don’t know. François Vuillaume is the current Membre, responsable “canaris de posture”, but he has only been in post for a year. Nevertheless, complaints about the judging at the World Show are a perennial problem and I hope he will address them. Ernest Gracia, a regular judge at the Amigos del Canario Lizard show; and Anne Houtkooper who has judged the Lizarddag many times in the past. I wouldn’t normally criticise a specific judging decision, but Tony was in agreement. A personal view – the World Show COM/OMJ is a Colour Canary based enterprise / show, everything else is there under sufferance…….and is prone & liable to ‘suffer’ accordingly. The reluctance to allow an expansion of classes across many of the ‘Type/Posture’ sections, whilst understandable to some extent, the Show is big enough as it is, shows the regard COM has for Section E birds in general. Compare that to the Colour Section for numbers of classes and birds and then remember 100% of the Colour Canaries are either Clear of Self, with nothing for ‘broken’ or ‘defective’ ones ! You need a micro-spectrometer and ‘genius’ level to be able to discern some of the differences between certain of the mutations and there are umpteen classes with tiny numbers of birds in, yet Section E birds are ‘clumped’ in together or excluded/discredited lest they get a few more classes to support. The Lizard Fancy being so ‘small’, relatively speaking, British based, in a strongly ‘European’ body and at the end of the Schedule of classes probably does it no favours……although it would have less far to move to be granted it’s own. It doesn’t take someone to be intimately engaged in the show to see how the last few classes, expanded for this year, in a huge volume of birds ended up with people ‘scraping’ around to find someone to fit the last few classes in. The Fancy should probably be thankful that Ernest and Anne, albeit primarily a Yorkie man, were able to be as involved as they were. As it happens, in conversation with a current fancier, my being ‘ex’, I predicted 99% of the content above without seeing anything apart from the bare result. Credit to those who brave what is to some extent a lottery, but as Phil Warne found when he sent a team to the World Show a few years ago to be credited with fairly ‘measly’ scores, the OMJ process is not all it is cracked up to be, especially with so few Lizard fanciers being trained to adjudicate? Fingers crossed everyone’s birds came home hail and hearty from the excursion. even in this picture the bird of Jules to only get 87 points clearly shows the judge does not have a clue what’s called for in the Lizard Standard…..id like to see the score card as its probably like reading a comic…..full of jokes and gaffs. We have to be careful about criticising a judging performance on the basis of a single photograph. 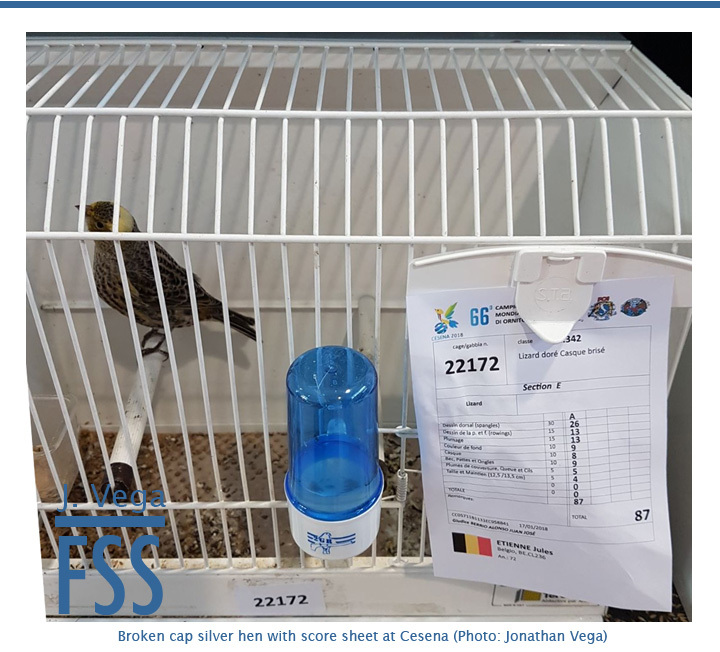 The photo was taken on the Friday, two days after judging, and the bird looks fine. When I saw the same bird on the Sunday, she looked ‘soft’. The key question is which version of the bird appeared in front of the judge? We don’t know because we weren’t there. The score card can be seen in the photo at the head of the article. Jules broken cap silver hen is a beauty. Huw, can you show us some photos off the spangles and the rowings from your non cap gold hen that won in Keyenborg please? She won a silver medal at the worldshow i believe. It is a fine example off a lizard that is close to perfection.Thanks. There is a photo of her in the gallery in Part 1. I have better photos, but they will have to wait for a future article.